Digital luxury positioning and intensive focus on design innovation, quality and heritage icons ensure continued brand purity and relevance globally across genders and generations. Burberry believes that in order to be a great brand it must also be a great company and constantly leverages the energy of its compassionate and creative thinking culture to continually innovate and drive the brand forward. 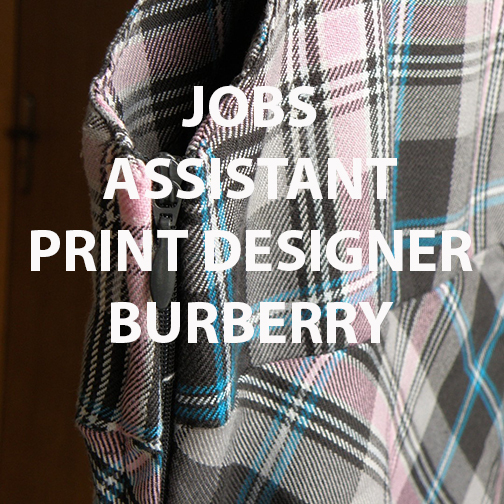 Headquartered in London, Burberry is a design, marketing and retail led business with a global reputation for innovative product design, digital marketing initiatives and dynamic retail strategies. Responsible for creating a modern collection of print artworks with a strong fashion direction using Burberry’s iconic heritage and attitude as a foundation along with the Print Design team. Follow creative direction and actively propose artworks and concepts. Gather research, create mood boards, generate ideas, artworks and launch artworks. Work collaboratively with cross functional teams. Utilise appropriate and innovative techniques and processes to deliver prototypes and products. Adhere to the corporate calendars and critical path. Support Textile team members as a team to ensure that the overall “design concept” is achieved. Strong concept, research and creative skills. Great free-hand drawing, collage, imaging making and photographic print skills. Exceptional Illustrator & Photoshop Skills. Technical knowledge regarding garment construction. Knowledge of design, development and implementation. Passion for fashion and product knowledge –knowledge of trends, the market, peer awareness and knows the luxury consumer. Can operate at pace and with a sense of urgency. Ability to communicate with functional experts in Design, Fabric, and PD. Textiles or Printed Fashion MA or Degree. 2 plus years’ experience within the industry preferable.